TERRE HAUTE, Ind. - Hoosier native Nicholas Phillips will perform as part of the Indiana State University Visiting Artist Series at 7:30 p.m. Friday, April 10 in the Recital Hall of ISU's Center for Performing and Fine Arts. He will also present a master class for ISU piano students from 3:30-5 p.m. Thursday, April 9, in the Recital Hall. Both events are free and open to the public. Phillips will perform three movements of Franz Joseph Haydn's "Sonata in E-flat Major," Piano Sonata No.1 (1990) by Carl Vine and "Variations and Fugue on a Theme by Handel, Op.24" by Johannes Brahms at his recital on April 10. 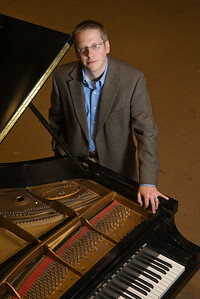 Phillips is an assistant professor of music at University of Wisconsin-Eau Claire, where he teaches applied piano, class piano, and piano ensemble. Active as a soloist and sought after as a collaborative artist, he is quickly building a reputation for his innovative recital programming and engaging lecture-recitals, with a special interest in introducing and reviving works and composers outside the mainstream repertoire. He began formal piano lessons at Indiana University at the age of ten. He holds degrees in piano performance from the University of Missouri-Kansas City Conservatory of Music (Doctor of Musical Arts), Indiana University (Master of Music), and the University of Nebraska-Lincoln (Bachelor of Music). Phillips has received awards for his own teaching, including the Muriel McBrien Kauffman Outstanding Graduate Teaching Assistant Award from the UMKC Conservatory of Music. Phillips is familiar with the Terre Haute and Indiana State communities. His grandfather, John Tranbarger, was an Indiana State alumnus and associate professor emeritus. Phillips' grandmother, Mary Ella Work Tranbarger, also earned degrees from Indiana State and taught at Gerstmeyer, North Vigo and South Vigo. His mother, father and brother are also graduates of Indiana State. For more information, contact the music department at 812-237-2772. Hoosier native Nicholas Phillips will perform as part of the Indiana State University Visiting Artist Series at 7:30 p.m. Friday, April 10 in the Recital Hall of ISU's Center for Performing and Fine Arts.